Steven (Chicagoland, United States) on 9 July 2010 in Art & Design and Portfolio. 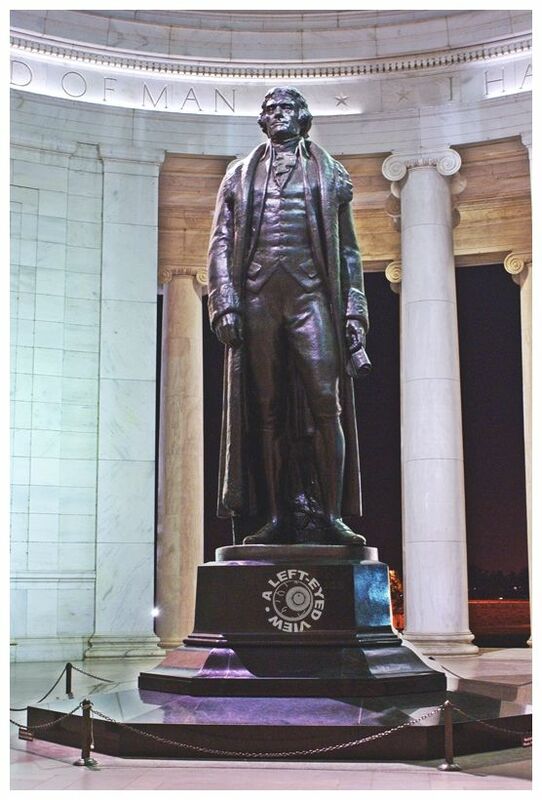 The interior of the memorial has a 19-foot tall, 10,000 pound bronze statue of Jefferson by sculptor Rudulph Evans, which was added four years after the dedication. The interior walls are engraved with passages from Jefferson's writings. Most prominent are the words which are inscribed in a frieze below the dome: "I have sworn upon the altar of God eternal hostility against every form of tyranny over the mind of man." This sentence is taken from a September 23, 1800, letter by Jefferson to Dr. Benjamin Rush wherein he defends the constitutional refusal to recognize a state religion. Nice shot.. I see some glare in the photo, not sure where it is coming from. thanks for the info. I so dearly respect that quotation by Jefferson. Those who attempt to control or direct our thoughts and opinions in an insidious way abound these days. If Jefferson were alive he would probably be sickened. All we can do is look to him and try to carry on and conduct ourselves in a fair and calm manner. So much for my soapbox - but I really am attracted to your treatment of this one Steven, This is a great tone and appearance - beautifully composed and presented as always. Thank you sir - have a great weekend. Great framing and POV . Love the impact this has . . very impressive. I'm impressed by the placement of your usual logo, spot on! Great perspective, super light, well done! Probably, one of the smartest Americans so far. Too bad all of us don't have at least a small measure of his intellect. A splendid photo of the sculpture and memorial. Your watermark looks like part of the statue:-) Nice. Your watermark logo is perfect! I like where you put your stamp! This is a powerful 3d portrait! it's a nice capture .. Very beautiful photograph, well has you. and thank you for your visit.